I bought the press in 1999 or 2000 from Dan Britton, one of my instructors at Arizona State University in Tempe. At that time, it was a litho press and it had been in Dan’s studio for more than a few years. 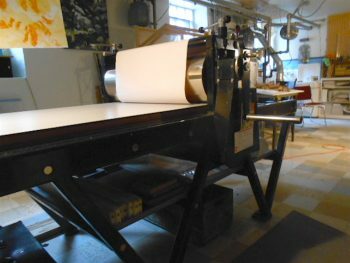 Soon, I loaded up the press-bed and litho yolk and took them to Takach Press in Albuquerque. They resurfaced the press-bed made the new head for intaglio. Then we picked up the litho yolk, the intaglio head, and the press-bed and drove it all back to Tempe. When my wife and I relocated a year later, we moved The Press across seven states to Georgia and a little garage studio in Savannah, Georgia. The men who moved the press cursed as they lifted the press-bed above the three-foot fence. I have set up The Press three times, most recently in the basement of my St. Louis home. Together we have produced intaglios as small as 3”x2” and reliefs and monotypes as large as 22”x30”. With the first good proof I go upstairs to share the progress with my wife, and we discuss the image’s impact. When the puzzle of printing is solved all that is left is the tempo of printing. It is always interesting to find the rhythm of printing for each image. How many passes of ink? How often to add ink? How much press pressure? What does each plate need in order to be full and consistent? Movements become choreographed to be effective, The Press and I contently working in tandem. Even at times when teaching or a lack of progress keeps me from working with the press, there is pleasure in cleaning the drums and wiping the dust off the frame with an oiled cloth. As with many things and friends there is comfort in knowing that it/they are there ready to continue the conversation, to explore new rhythms and tempos, to reach an agreement. And now I am now setting up baths, acquiring paper, and building a large aquatint box for the four 2’x3’ sheets of copper I recently purchased. It’s time to go big and see what large plates hold. Which reminds me—I need to check my tarletan.